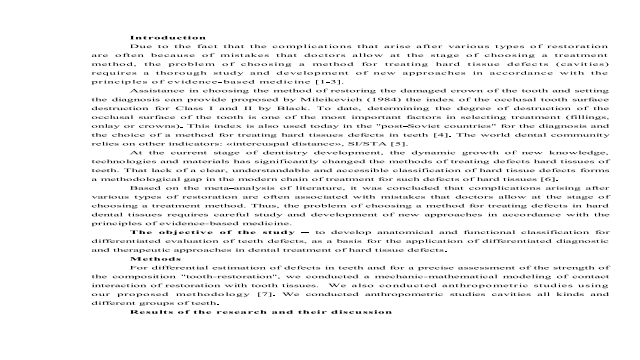 Abstract: Background: Previous research have established – in the problem solving of diagnosis and treatment of hard tissues defects, a significant role belongs to the choice of tactics treatment tooth destruction. This work aims to study the diagnosis problems and cavity classification, what will facilitate objectification of diagnostic and therapeutic approaches in the dental treatment of patients with this disease. Methods: For differential estimation of defects in teeth and for a precise assessment of the strength of the composition "tooth-restoration", we conducted a mechanic-mathematical modeling of contact interaction of restoration with tooth tissues. We also conducted anthropometric studies cavities all kinds and different groups of teeth. Results: As a result of the study, was proposed the cavity classification LOV/DD, is offered the method choice algorithm of treatment hard tissues defects, wich is based on classification LOV/DD, and can serve as a selection criterion in the treatment of such pathologies. Conclusion: The proposed classification fills the obvious gap in academic representations of hard tissue defects, suggests the prospect of reaching a consensus on differentiated diagnostic and therapeutic approaches in the treatment of patients with this disease. 1. Smithson J, Newsome P, Reaney D, Owen S. Direct or indirect restorations? Int Dent. 2011;1(1):70-80. 2. Liebenberg W. Return to the resin-modified glassionomer cement sandwich technique. J Calif Dent Assoc. 2005;(71):743-7. 3. Nikolaev AI. Sistemnyiy podhod k diagnostike i kompleksnomu lecheniyu karioznyih i prisheechnyih nekarioznyih porazheniy tverdyih tkaney zubov : kliniko-laboratornoe issledovanie [avtoreferat]. Smolensk: 2012.37 s.
4. Abolmasov NG, Abolmasov NN, Serdyukov MS. Ortopedicheskaya stomatologiya. M. : MEDpress-inform; 2018. 556 s.
5. Zarow MD, Arcangelo C, Paolone G, Paniz G, Felipe L. EndoProsthodontics – Guidelines for the clinical practice. Chicago: Quintessence Int; 2016. 6. Mount GJ, Hume WR. A new cavity classification. Aust Dent J. 1998 Jun;43(3):153-9.